A new book argues that the key to decoding the Bible is understanding its poetry. The quickest way to understand the audacity and originality of what David Rosenberg is attempting in A Literary Bible, the big book of his selected translations from the Hebrew Bible, is to read the introduction to his excerpt from the book of Jeremiah. To countless generations of Bible readers, Jeremiah has been a prophet—indeed, the Hebrew prophet par excellence, his very name a synonym for warning, chastising, and exhorting. To Rosenberg, however, the person (or people) who wrote this book is primarily a poet, whose “main form is the prophet’s oracle”—much as we might say that Shakespeare’s main form was the sonnet. The LORD put out his hand and touched my mouth, and the LORD said to me: Herewith I put My words into your mouth. For almost all readers until modern times, reading these lines meant taking their claim at face value. Jews, and Christians, listened to Jeremiah not because he was a good writer, but because he was chosen by God to deliver a message of the utmost urgency. David Rosenberg knows, however, that we are living in a period when the Bible’s only claims on the attention of many readers is literary. That is why, in titling his book A Literary Bible, he is performing a clever dialectical maneuver. Yes, the title tells us, this Bible is literature, and not even canonical literature: it is a highly selective anthology of stories and verses, rendered into deliberately anachronistic, 21st-century English. Yet Rosenberg believes that literature can and should possess the same kind of moral force and spiritual insight once reserved for Scripture. For him, poetry is the only really sacred speech. It follows that to call Jeremiah a poet is actually a promotion, replacing the doubtful miracle of divine inspiration with the genuine miracle of poetic inspiration. to the words that bade them live. When Rosenberg translates Jeremiah, it is plain, he is not just translating Hebrew into English, or biblical idiom into contemporary concepts like “reality” and “imagination.” More profoundly, he is translating the concrete and pragmatic faith of the Hebrew Bible into the abstract and metaphorical faith that is all he, like many of us, can really believe in. For there is a reward for your labor. They shall return from the enemy’s land. Your children shall return to their country. This is what a grieving mother would want to hear, a simple promise—your children are still alive and they are coming back. Jeremiah can make this promise because he believes in an actual God who is all-powerful. What we meet with in the best, most moving passages of A Literary Bible, on other hand, is a literary God, who has both the power of literature—since poetry can move, inspire, provoke—and the weakness of literature—since poetry is always hypothetical, a matter of thought and feeling rather than history and covenant. Rosenberg, in his fervor for the power and privileges of poetry, does not always make this distinction as clear as it should be. In his notes and his afterword, Rosenberg is oddly abusive towards biblical scholars like Robert Alter and James Kugel, whom he casts as dullards and pedants, deaf to the Bible’s poetic genius. 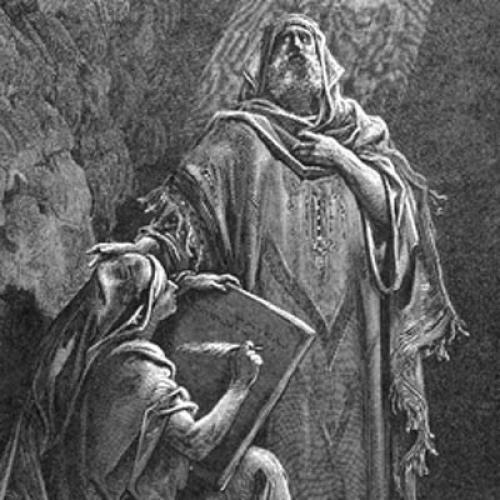 As a poet himself, he claims a privileged access to the biblical writers’ minds, which allows him to make sweeping and unsubstantiated claims about their intentions—for instance, that “the writers of the Hebrew Bible did not consider themselves divine.” This kind of certainty is characteristic of poets like Ezra Pound and Robert Lowell, whose translations of foreign poetry were imperially bold, and Rosenberg places himself in their tradition: “My apprenticeship in reclaiming biblical authors began, at nineteen, when I was Robert Lowell’s student in New York,” he writes. But translating Rilke, or even Aeschylus, as Lowell did, is fundamentally different from translating the Bible. A text that claims to be the Word of God makes existential demands on us that a human text, even an ancient and prestigious one, does not. Robert Alter’s translations (which Rosenberg insults) respect the absolute and alien nature of the sacred imagination; Rosenberg, in his very passion to make the Bible communicate, turns it into something more domesticated and acceptable. Onto what were its bases sunk? And all the divine beings shouted for joy? Here, as so often in the Bible, we are reminded that we do not “have understanding” of God, which is why his actions so often appear evil and inexplicable to us. It is precisely because God is God that he lacks “a human range of emotions”—and that is what makes him ungraspable in the terms of literature, which is a humane art. Perhaps it takes a prophet, rather than a poet, to make us see God face to face.